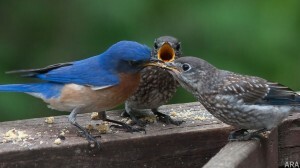 (ARA) – It’s a myth that continues to persist: Feeding birds in spring and summer will spoil them. But birds are like babies – it’s impossible to spoil them. Contrary to the myth, well-fed birds won’t get too lazy to search for food; they’ll just get healthy and happy. And the better the food is you feed them, the more likely they’ll continue to come back bringing their colorful plumage and welcome song to your backyard. Myths aside, wooing beautiful backyard birds to your outdoor environment can be as simple as offering them a reliable, high-quality food source. Birds, like most wild animals, are survivalists and they’ll take advantage of any food source they find – whether it’s in your yard or your neighbor’s. * Suet – Made from the fat of cattle, sheep, or even vegetables, suet may sound icky to us, but for birds it’s a gourmet delight that helps them stay healthy and build vital fat reserves. Served in a cage or log, suet has the consistency of soft wax and can be kept for a long time. Chickadees, titmice, catbirds, bluebirds, robins, jays, warblers, thrashers, nuthatches and all species of woodpeckers relish suet and will feed on it all year round, even in warm months. 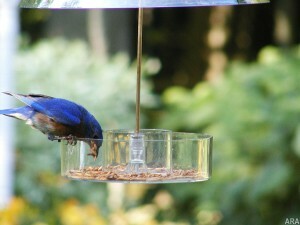 If your suet gets too soft in the warm summer months, switch to a no-melt, cornmeal-based suet. Suets offer a variety of enhancements including seeds, pecans and peanut butter. To keep squirrels from stealing your suet, try Cole’s Hot Meats suet cakes that contain chili-infused sunflower meats. Birds can’t taste the hot spice and squirrels will high-tail it out of your feeder once they try it. * Seed – Not all birdseed is created equal. Look for blends without cheap filler seeds that are all natural, that way, the birds get more nutrition and you keep a cleaner feeder; the less filler, the less leftovers birds will kick out and leave behind. All-natural feeds are more appealing to birds, who know that natural just tastes better. It’s important to remember that all birdseed is perishable. Be sure and store any open product in a cool, dry place away from direct sunlight to prevent the seed from drying out and little critters from finding it. Cole’s seed is offered in nitrogen-purged barrier packaging to ensure seed freshness. They use the same packaging technology employed by potato chip makers and fresh vegetable farmers to keep their products fresher longer. If unwelcome squirrels raid your bird feeder, opt for a seed blend like Cole’s Blazing Hot Blend, new this spring. By combining a patented habanero chili oil formula with the most preferred seeds of backyard birds you can protect your feeder from squirrels while attracting woodpeckers, grosbeaks, buntings, cardinals, chickadees, bluebirds, goldfinches and more. Squirrels don’t like the hot, spicy flavor, but birds won’t be able to detect it. * Insects and worms – A healthy, lush lawn is one of the best ways to feed birds who prefer insects and worms. A good lawn will attract the species of insects that birds enjoy. You can also supplement their diet by serving Dried Mealworms in a packaged variety that’s easier to feed and less messy than live mealworms, and birds love them. These energy-packed morsels are Mother Nature’s perfect treat for all your insect-loving songbirds. * Garden favorites – Feeding birds doesn’t just have to happen at the feeder. Thoughtful planting in your garden can help entice wild birds to forage there. Offer a birdbath for water and berry-producing trees and shrubs. Plant annuals and perennials that birds like, such as sunflowers, marigolds, petunias, Sweet William, nasturtium and blueberries. Climbing vines like morning glories, coral honeysuckle, muscadine and trumpet creeper are also favorites. By serving wild birds their favorite foods throughout the summer, you can boost and build their stamina and reserves for the long winter ahead – and all the while you’ll enjoy a birds-eye view of a multitude of species bringing bright color and cheerful song to you throughout the warm months. Thanks for the info! We really enjoy feeding the birds and will try some of your suggestions to entice even more. Thanks for the tips. I am trying to add things to my garden, to bring in the birds. Some of mine seem to prefer that cat food tho. There is nothing better than seeing birds enjoying themselves in your garden- I always feel like I am doing something right when they come and visit 🙂 Thanks for the info how to get more to come and stop by my garden.